Video, USB 2.0, audio and RS232 signals all pass along a single CATx extension cable. 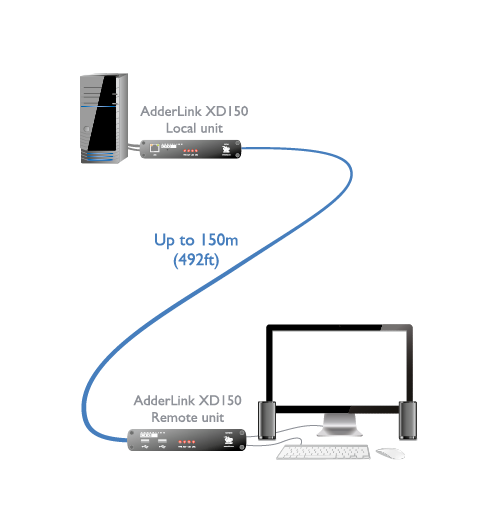 Distance is dependent on the monitor resolution, cable type and number of connection breaks for patch panels and wall plates. See the table on the datasheet for details. RS232 can be passed between the units to a maximum baud rate 115K2 via the options port. Adder’s RC4 remote key switch is also supported. An easy-access rack mount kit is available for neat mounting of two units in 1U of rack space. All computers with DVI, USB and audio. The system supports resolutions to a maximum of 1920 x1200@60Hz. Supports USB 2.0 devices (low, full and hi-speed). Isochronous devices are supported. DVI , audio 3.5mm in, USB type B, RS232 10p10c options port, mini USB for firmware upgrade. DVI, audio 3.5mm out, USB type A x 4, RS232 10p10c options port. 3 Pin Locking DC jack (2 x power adapter included),100-240VAC 50/60Hz, 0.7A, input to power adapter, 12VDC 18W output from power adapter.